All activity in Ruby involves sending a message to an object, and all application scripting involves sending an Apple event to a scriptable application. Small wonder, then, that the first thing you need in order to script an application with Ruby is an object representing the target application. This chapter describes how to get one. Getting an application object may seem like a small thing, but it’s crucial. The longest journey starts with a single step, and without this single step, there’s going to be no journey at all. Scripting an application is like talking to a friend over the phone; getting an application object is like dialing the phone and having your friend answer. You can’t talk to your friend at all until the call has gotten through and you know your friend is waiting there at the other end. So let’s dial that phone! In rb-appscript, the high-level way to get an application object is by way of the Appscript module. The Appscript module lives in the file appscript.rb. So before any Ruby program can target a scriptable application, it is necessary to make sure that appscript.rb is loaded. How you load appscript.rb depends on how you’ve installed rb-appscript. I can’t know how you’ve done this, so I can’t give precise instructions for your situation. However, I’ll just describe a couple of the most likely scenarios. In this book, nearly every example script simply assumes that you have already loaded the Appscript module; it would be very boring if I said require 'appscript' at the start of every script, so I’ll usually just omit it. Use app.by_name when you want to specify an application by its name or by its pathname. You supply a string (expected to be in UTF-8 encoding); if the string starts with a slash ("/") it is taken to be a pathname. If you know that the application’s name ends in .app you can save some time by including the extension at the end of the name or pathname; but this is not required (if the attempt to find the application in the form you gave it fails, rb-appscript will append ".app" and try again), and if you are in doubt, it might be best not to add it, since some application names do not end in .app. Speed. Specifying a pathname is considerably faster, because rb-appscript doesn’t have to call LSFindApplicationForInfo — it just looks to see if a file actually exists at the pathname you specified. Versions. If you specify an application by name alone, then if there are multiple applications by that name, LSFindApplicationForInfo might pick the wrong one. Use app.by_id when you want to specify an application by its bundle identifier. The bundle identifier is a string unique to the application; by convention, and to help increase the likelihood of uniqueness, it is formed using “reverse DNS notation”, often starting with "com" and including the company or developer name, like this: "com.neuburg.zotz". Every application is supposed to have a bundle identifier, and although in practice some older legacy applications may not have one, the bundle identifier is generally the best way to identify an application, since the user can change an application’s name in the Finder, but the application’s bundle identifier is unlikely to be changed, and works regardless of where the application is installed. Like app.by_name when a mere name is specified, app.by_id calls LSFindApplicationForInfo to get the application’s pathname. Use app.by_creator when you want to specify an application by its four-letter creator code. The creator code is the legacy way of specifying an application uniquely, so it should work for older applications where app.by_id will not. Newer applications may have a creator code, but it isn’t required, so many do not. Moreover, some applications use the creator code incorrectly (a notorious example is that Adobe Reader and Adobe Acrobat share the same creator code). So it is probably advisable not to use the creator code as an identifier unless you have to (because there’s no bundle identifier). Like app.by_id, app.by_creator calls LSFindApplicationForInfo to get the application’s pathname. Use app.by_pid when you want to specify a running application by its process id. The process id is a number assigned by Unix (which, as you know, underlies Mac OS X) as a process starts running. Every running process at any given moment has a unique process id, which it retains until it exits, so this is a way of uniquely identifying this process among all the processes running at this moment. Obviously, this approach works only if the desired application is already running; but it has the advantage, in such a case, that it’s extremely efficient, and of course it can distinguish between multiple versions of the same application, because even if multiple versions of the same application are running, they have different process ids. $ ps -cx | grep "iTunes"
So the iTunes process id at this moment is 1522, and we could use this to target iTunes, as long as iTunes continues running. If you want to make sure that a process id is going to work (that is, that there is such a process and that it is scriptable), you can take advantage of the is_running? method, discussed below. Use app.by_url when you want to specify a running application on a different computer or running under a different user. It may come as a surprise to learn that this is possible; but it is. The reason is that there is a protocol, called eppc, whereby an Apple event can be sent across the network. In order for this to work, Remote Apple Events must be turned on in the Sharing pane of System Preferences on the remote machine. Note the structure of the URL. It is an eppc URL; this is required. The URL hostname then identifies the computer; since this computer is on my local network (it’s in the living room, while I’m working at my office machine), I can use its Bonjour name to identify it. 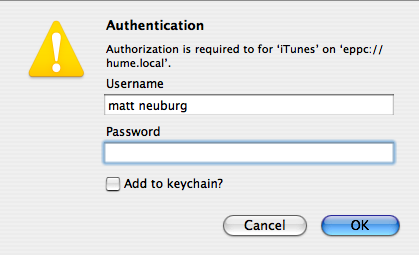 Finally, the URL path gives the name of the running process I’d like to talk to; in this case, it’s iTunes. Merely forming an Appscript::Application instance with app.by_url, however, doesn’t tell you whether your URL is actually going to work or not. When rb-appscript forms an Appscript::Application instance with the app.by_url method, it merely records the URL; it doesn’t actually try to establish a connection to the remote application. To test properly, we should attempt to make the remote application do something. Anything will do, so let’s pick something minimal that all applications know how to do: launch. This command has no effect on a running application, but it is sent to the running application, so it makes a good minimal test. When I run that script, an authentication dialog (oddly ungrammatical, on my machine) appears asking for a username and password (Figure 4–1). I provide the requested information, and the script runs to completion without error. This tells me that I’m forming the URL correctly. Another, even more minimal way to make sure an eppc URL is going to work is to take advantage of is_running?, discussed below. That has the disadvantage, of course, that the password is hard-coded into the script in plain text; it might be better to accept the dialog’s offer to record the password in the local machine’s keychain the first time we contact the remote machine. One of the purposes of being able to specify a user ID number is that Mac OS X can have multiple users logged in simultaneously (“fast user switching”). Thus an application might be running under a user different from the user whose world is currently displayed on the screen. You can also use this technique to script an application running under a different user at the same computer where you’re already working. To do so, Remote Apple Events on this computer must be turned on. To learn a user’s uid, a simple approach is to use id at the command line. #=> "All Baroque Musick(1.FM TM)"
Now iTunes is running on the remote machine and can be scripted. There are two further application object factory methods, but they are much less commonly used. app.by_aem_app uses an AEM::Application instance to generate an Appscript::Application instance; but you are unlikely to have formed an AEM::Application instance, unless you were thinking of doing some lower-level stuff with Apple events. app.current generates an Appscript::Application instance referring to the host process; this is unlikely to do you any good, because the host process is Ruby and isn’t scriptable. An Appscript::Application instance is just about useless for any other purpose than to send it an Apple event. But rb-appscript does provide one Appscript::Application instance method that does not send that application an Apple event, and for that very reason is extremely useful: is_running? app.by_name, app.by_id, and app.by_creator: These are all translated by Launch Services to the full pathname of the specified application, so the result is true if the application with that pathname is in fact running. If you send an Apple event to an Appscript::Application instance generated by one of these factory methods, then if it is not running, it will launch. And even attempting to fetch the application’s dictionary might launch it. Thus, is_running? is your only chance to prevent a potential target application from being launched. app.by_pid: true only if there a process with the process id used to form this instance, and if that process is scriptable. app.by_url: true only if an attempt to connect to the specified remote application succeeds. The attempt to connect will put up the authentication dialog if the URL didn’t include a username and password. If you can’t authenticate, or if the process isn’t running, or something else is wrong with this URL, you’ll get back a false result and you’ll know that the Appscript::Application instance based on this URL isn’t going to be any use to you at the moment. As we saw in the preceding chapter, rb-appscript works by fetching the target application’s dictionary; that’s why you are then able to talk to the Appscript::Application object using English-like terms from that dictionary. Unfortunately, the mechanism that rb-appscript uses to do this is somewhat fragile; it can break. If this happens, you might like to use a static dictionary instead. To allow this, all the Appscript.app constructors mentioned in this chapter (by_name, by_id, and so on, plus the shortcut Appscript.app()) take an extra optional parameter consisting of a module name. The module in question must have been loaded already, and it must have been created with, or have the format created by, appscript’s Terminology.dump command. As a matter of fact, this situation has already arisen with some major scriptable applications. In particular, iTunes 10.6.3 may appear to you to have broken rb-appscript! But fear not. A file containing the module that you need in order to keep using rb-appscript with iTunes is available for download here. Here’s what to do if iTunes 10.6.3 has broken your use of rb-appscript to script iTunes. Download the file from that link. It’s a zip file, so double-click it to unzip it. The resulting file is called tunes.rb, and it contains a module called Tunes. (Of course you’re free to rename the file, the module, or both. But let’s assume you don’t do that.) Now, you want to store tunes.rb where it can easily be found by Ruby’s require command. Of course, any file can easily be found by Ruby’s require command if you provide a full pathname, but it’s simpler to put it in your Ruby library; that way, you can refer to it simply by its name. On a Mac, the Ruby library is at /Library/Ruby/Site/1.8/ (or whatever your Ruby version number is). So put tunes.rb inside that folder. That’s all there is to it! You’re back in business.